Bangalore: The 12 ports owned by the Union government together handled 268 million tonnes (mt) of cargo in the first six months of the current fiscal year, clocking a paltry 2.3% growth over the 262 mt they handled in the previous year. The statistics released on Friday by the Indian Ports Association, or IPA, an umbrella body representing the dozen ports, reflect the impact of the global economic slowdown on India’s port traffic. The cargo volumes handled by the 12 ports in the first six months of the current fiscal year were some 6% below the target of 285 mt set by the shipping ministry, said A. Janardhan Rao, managing director of IPA. “But when compared with the global scenario where ports are showing a negative trend, Indian ports are showing a positive trend." In major revenue earners such as petroleum, oil and lubricants (POL) and iron ore, cargo volumes between April and September grew 2.4% and 4.8%, respectively, over the same period last year. The 12 ports handled 86.16 mt of POL cargo during this period, against 84.14 mt a year ago. Iron ore cargo shipped through these ports rose to 42 mt from 40 mt earlier. Faring better, thermal coal cargo handled at these ports jumped 16% to 23 mt in the first half of 2009-10, from 19.8 mt a year earlier, as power producers imported the fuel in large quantities to meet India’s power generation demand. But coking coal cargo shipped through these ports declined 23% to 12.7 mt from 16.6 mt as steel makers cut production due to lower demand. Finished and raw fertilizer cargo volumes declined 16.6% and 10.7%, respectively. Similarly, high-value cargo transported in containers through the dozen ports registered a drop of 6% to 3.32 million standard containers from 3.55 million standard containers a year earlier. 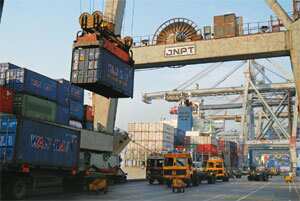 Jawaharlal Nehru Port Trust, which operates India’s busiest container port, handled 1.99 million standard containers, down from 2.12 million standard containers previously. Of the 12 major ports, Paradip on the eastern coast and Mormugao on the western coast, two of India’s biggest iron ore handling ports, registered cargo growth of 24% and 23%, respectively. Cargo volumes at the Kolkata port, though, declined 13.65% as depth restrictions and congestion prevented ships from calling. Still, IPA’s latest statistics indicate a recovery could be on the way. Drewry’s Garg said the stimulus packages given by several nations, including India, started showing results in August and September. “The situation is improving," he said. “Still, these are early days. So we should wait to say that the global economy has turned the corner."